The start of the semester is right around the corner. Thousands of college students will be returning to campuses in and around Pittsburgh. 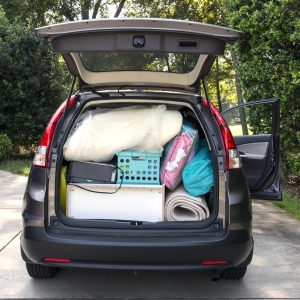 As you get ready to pack up and move to your off-campus apartment, there are a number of ways you can make moving off campus a breeze. Avoid the student rush. One of the biggest advantages of moving off campus is having flexibility around when you can move in and out. If your off-campus housing is available sooner, try arriving a few days early so you can get settled in before the chaos of campus “move-in day” ensues. Make a moving checklist. If you are going to have roommates, make sure you talk over the summer about what items you think you’ll need for your off-campus apartment. Then divide the list evenly between members of your group. In most cases, you’ll likely have most of what you need. Be smart about moving large items. When you’re living in a dorm, you generally don’t have to worry about bringing your own bed, dresser, or desk. Living off campus is an entirely different story. Unfortunately these items are bulky and can quickly take up a lot of space in a moving van. It can also be really difficult to move a queen mattress up a flight of stairs or through a tight hallway. To save yourself (and your parents) from any unnecessary headaches, consider looking for a local retailer that offers free delivery. Bargain shop. Because you will only be staying in your off-campus housing or apartment for a short period of time, save money by looking for used or second-hand furniture. Locally Construction Junction, Habitat for Humanity’s Restore, Craigslist, and Goodwill are great places to start. However, one thing you definitely don’t want to buy second hand is a mattress due to the potential for bed bugs. Get connected. Make sure utilities including gas, electric, internet, and cable are transferred over to the appropriate point of contact for your apartment and that they are switched on to coincide with your move-in date or within the first few days. The last thing you want to do is unpack on a hot day in August or September without air conditioning. Moving into an off-campus apartment is an exciting time but it can also be a little overwhelming. By planning ahead you can save time and money and eliminate unnecessary stress. At Sleep Pittsburgh, our back-to-school mattress sale has been helping college students at Pitt, Carnegie Mellon, Chatham, and other local campuses find the best deals on mattresses, futons, and bunk beds for more than 25 years—all with free delivery and setup to any college campus in Western Pennsylvania. Call 412-462-7858 to learn more about pricing.